Yesterday I asked if you all were sick of all the s’more treats. I then teased that all these sweet s’mores treats were going to cause me extra trips to the dentist but I think in reality my waistline is beginning to suffer from all my s’more madness. I really don’t see how popular baking bloggers not only maintain their blog but their girlish figure with all those sweet treats they are always making and blogging. The must have some secret they are not telling us! But today’s recipe is the not-so-guilty-still-maintain-your-bikini-body-yet-enjoy-a-sinful-treat s’more! Ever heard of a banana boat? Well, don’t worry I hadn’t until last summer when they seemed to be taking over the entire internet world. I was immediately intrigued and then delighted when I first made one and wondered why this yummy, yet not-so-bad-for-you treat had been missing from my life. A Banana Boat, in case it is new to you, is simply a grilled or roasted banana with various toppings. At first I thought that a warm banana would not taste that ‘hot.’ But then the more I thought about it, the heat would bring out the natural sweetness of the banana that then paired with some fabulous toppings, such as peanut butter, dried fruit, jam or nuts; would create a simple, yet drool wrothy treat. My favorite banana boat flavor is of course s’mores. 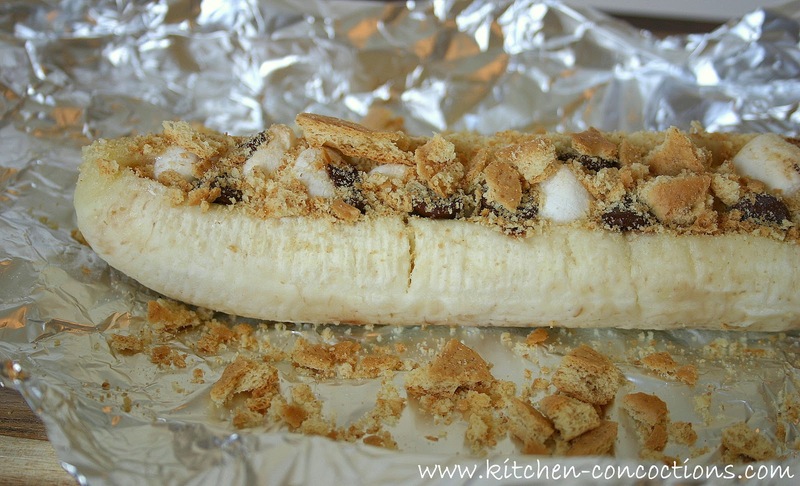 A banana with just a sprinkle of chocolate chips, marshmallows, and crushed graham crackers; warmed to perfection, will satisfy your sweet tooth without *totally* blowing that summer diet (for an idea about the nutritional info click here). Slice banana lengthwise and slightly open. Place on a rectangle of aluminum foil. 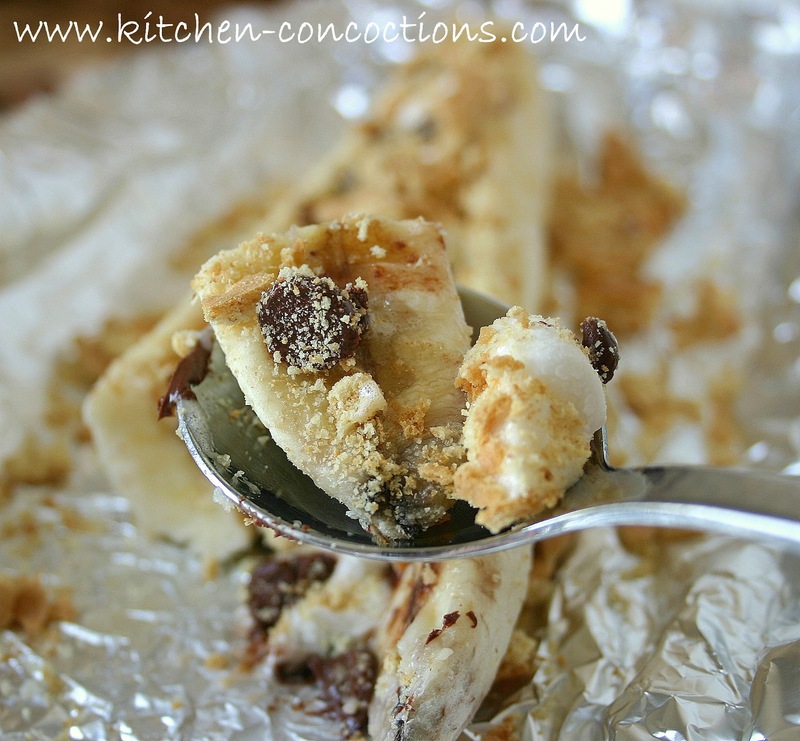 Insert marshmallows and chocolate chips into the sliced banana. Wrap banana up in foil and cook on the grill for 6-8 minutes. 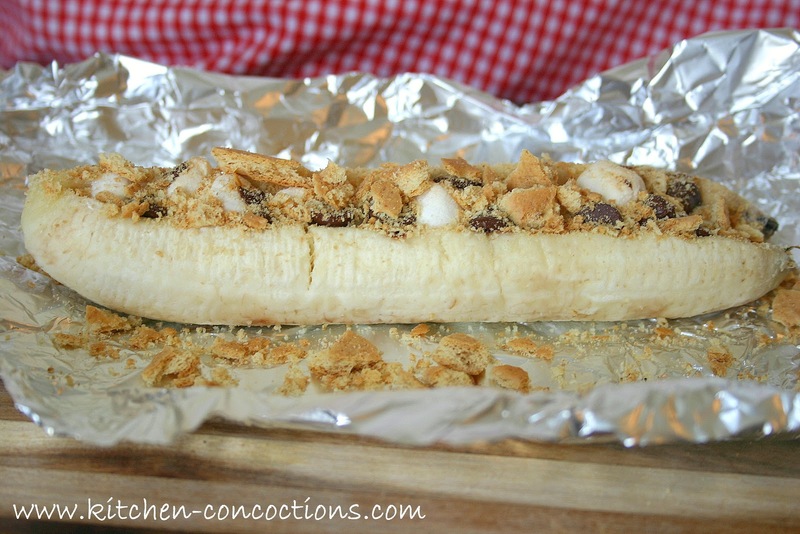 Unwrap banana and serve topped with crushed graham crackers. OVEN METHOD: Prepare as directed above and cook in preheated 400 degree oven for 6-8 minutes. MICROWAVE METHOD: Prepare banana as directed above, but DON’T wrap in foil. Place prepared banana on microwave safe plate and microwave for 1-2 minutes until soft and slightly melted. CAMPFIRE METHOD: Keep peel on banana; slice lengthwise twice, lift up flap of peel, slice banana and add chocolate and marshmallows as above. Replace peel flap and wrap banana with foil. Let the flames die down before adding banana packets directly to fire. Cook 3-5 minutes, or just until soft and slightly melted. Use tongs to remove from fire. Carefully unwrap and unpeel banana to eat. *Note: Some versions I have seen leave the peel on the banana and cut a slit through the peel and the actual banana. This is an option and would certainly help your banana hold up during the cooking process. However, I prefer to peel the banana for easier eating and a faster cooking time. This looks sooo good! A perfect treat for the 4th!